Foyer of the Staatstheater in Wiesbaden, just over the Rhein. Like the farm kitchen, the first of my personal loci amoeni I wrote about, the theater is no Vergilian garden–but a spot for me equally as transfixing, equally as bound up with memory and childhood and beauty. Like the kitchen, the theater is something that transcends all cultural boundaries: the moment before the curtain goes up or the conductor comes on stage is always the same, whether one is in Munich or in some drafty town hall in Vermont. My love of the theater started when I turned 15, and began working as an usher in the next tiny town over. The Barre Opera House–certainly no Baroque jewel, but it had white molding and red velvet curtains and four box seats (no one sat in them anymore, but they existed!). To me, it was an entirely enchanting place. 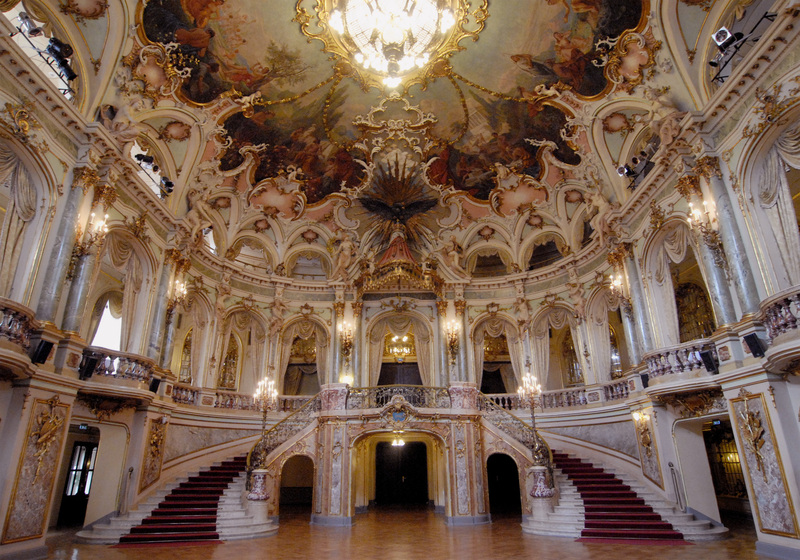 I would always work the balcony so I could use the secret spiral staircase in the wings, and lean out over the polished wooden railings, and pretend that I was in Vienna in 1791 for the premiere of Mozart’s Magic Flute. I loved the audiences, too–the aging, tenacious contingent of small-town Vermonters who could talk with equal ease about the local milk prices and the symphony on the program. Most evenings I had the feeling I was the only one in the place younger than 75, and I collected compliments from old men wearing immaculately pressed suits that must have been new sometime in the late sixties. There where two operas a year, and I remember driving home after Le Nozze di Figaro through the worst blizzard of 2008, drunk on Mozart for the first time in my life. Writing of his own childhood, Thomas Mann says, “I can never forget the hours of deep, solitary happiness in the midst of the theater crowd–hours full of horror and delight of the nerves and intellect, of insight into things of the most vast and moving significance, such as only this art affords.” He, as always, gets it just right. 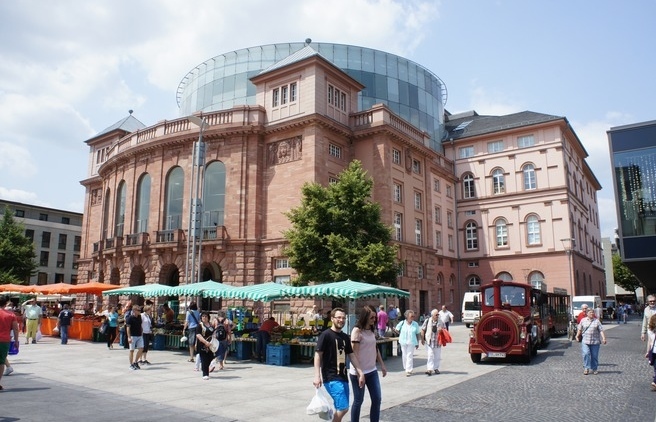 Staatstheater in Mainz, with weekly market. Still, America–and small-town New England above all–isn’t really made for theater-goers. Once we got older, my sister and I went to a handful of operas and plays a year, usually traveling over an hour and paying 35$ or more for a spot in the cheap seats. I called up the opera houses every year to ask about student discounts, but never got anywhere. The difficulties come in large part from the infrastructure behind the arts in America, which has a distinct air of precariousness. Funding usually comes from audiences and donors alone: if no one buys the tickets, the theater closes its doors. On one hand, such a close relationship between the audience and stage is good–on the other, however, the entire set-up keeps ticket prices high and stifles the creativity of directors and actors. One need only look at the Metropolitan Opera, currently on the verge of bankruptcy due in large part to the “risky new productions” (read: non-traditional, moderately avant-garde) brought in by the new manager Peter Gelb. In Germany, the entire system runs on different terms, and better ones, I think. This is truly the land of theater: every small town has at least one, and an opera house, and a symphony to boot. The amount of productions even the smallest of theaters is able to put on over the course of a season is staggering to me. For instance: at the Staatstheater in Mainz, certainly no metropolis, there will 78 performances of some 30 different works in December alone, spread between several different stages and often performing simultaneously with one another. In America, such a vast program would be inconceivable anywhere other than a very large city. Here, between Wiesbaden and Mainz, two small towns within ten minutes of each other, I could go to the theater every night for the next two years. The financial precariousness is entirely removed, too: even the smallest theaters in Germany receive hefty funding at the state or municipal level. It’s part of the mentality–being able to go to the theater in one’s own town is a point of pride, a vitally important facet of local culture and identity. At an artistic level, this financial situation means that almost anything goes on stage, for better or for worse (mostly for better, in my opinion). Directors can be as trashy or shocking or ground-breaking as they wish, without worrying about offending the sensibilities of a conservative audience. And for students, it’s an absolute windfall. With my card from the University I can see anything in Mainz for free, and get front-row tickets at pretty much any other theater in Germany for 4-8 €. And so I go to the theater. There’s a sort of rhythm to it all–dress up, look at train schedules, run to the station and read on the train, wait in line at the box office, look around the city a bit during intermission (intermissions in Germany are long, because EVERYONE has to drink a glass of Sekt [champagne] and eat a Brezel! ), rant about the whole thing on the way home. It’s exciting, and utterly new. 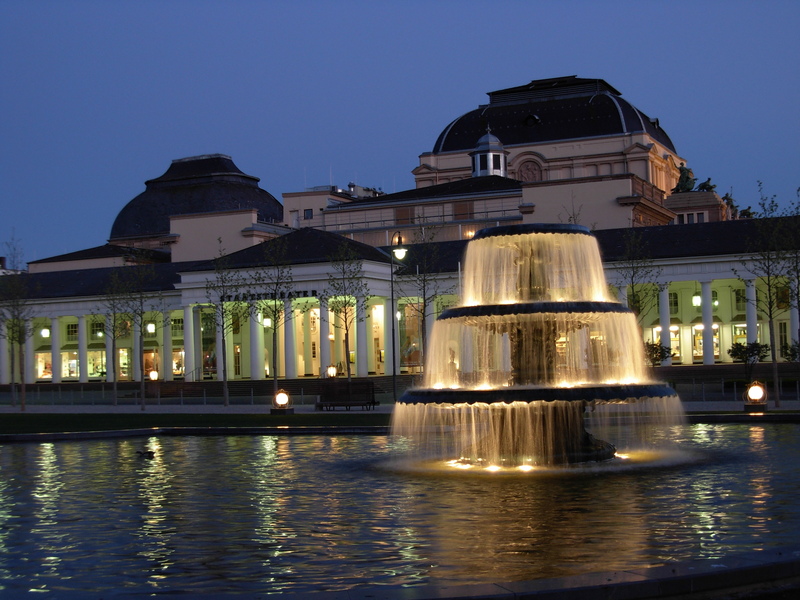 Staatstheater in Wiesbaden by night. Henrik Ibsen’s A Doll’s House (or Nora in German, because Puppenheim just sounds weird). In Frankfurt, where we gawked at the sky scrapers and tried without success to find Goethe’s house. The production: shattering, minimalistic, with spotlights shone directly into the audience and rock music turned up too loud. It’s Germany; everything’s designed to make you uncomfortable. It’s astonishing to me how a work some 150 years old can be so relevant. Gustav Mahler’s Das Lied von der Erde, performed in the local museum in a room full of frescoes and statues from ancient Greece. Mahler is absolutely wrenching live. Elfriede Jelinek’s brand-new Rein Gold in Wiesbaden. Jelinek is insane; I’ve been obsessed with her ever since my professor told me I must on no account, read her novels, because they were borderline pornographic filth. She’s everything I love about German literature: edgy and hard-hitting, willing to ask the hardest of questions. Rein Gold was a Bühnenessay (Stage-essay; the first of its genre according to the authoress)–a witty, often disturbing meditation on Richard Wagner’s Ring, taking up the themes of capitalism and heroism in modern Germany. Lots of references to the current political situation that I didn’t understand, lots of references to Wagner that I did. This entry was tagged beauty, culture, Deutschland, Elfriede Jelinek, German culture, Germany, locus amoenus, Mainz, music, opera, theater, vermont. Bookmark the permalink. I love that you give some history, and quotes, along with your personal take. These blog entries are gems! How blessed you are to have so much theatre and opera, free or cheap and in your home town or across the river. Soak it up. Sit me beside you! Sounds like you found your spot!